The DNA is an organism's “blueprint” that provides not only the ability to sustain activities of life but also insight into our evolutionary past. The process of DNA replication is highly regulated to ensure as close to 100 percent perfection when making a copy of our genome as possible. DNA replication is necessary for the reproduction of a species and for any dividing cell. The human genome has about 3 billion base pairs packed into multiple chromosomes. The replisome or replication complex is a set of specialized proteins that assist the DNA polymerases. To begin the process of replication, DNA unwinds at points called origins of replication. The generation of new DNA proceeds in both directions, creating replication forks on both sides of the origin, as shown in Figure 6.12. Figure 6.12. Origins of Replication Replication forks form on both sides of the origin, increasing the efficiency of replication. The bacterial chromosome is a closed, double-stranded circular DNA molecule with a single origin of replication. Thus, there are two replication forks that move away from each other in opposite directions around the circle. The two replication forks eventually meet, resulting in the production of two identical circular molecules of DNA. Eukaryotic replication must copy many more bases compared to prokaryotes and is a slower process. In order to duplicate all of the chromosomes efficiently, each eukaryotic chromosome contains one linear molecule of double-stranded DNA having multiple origins of replication. 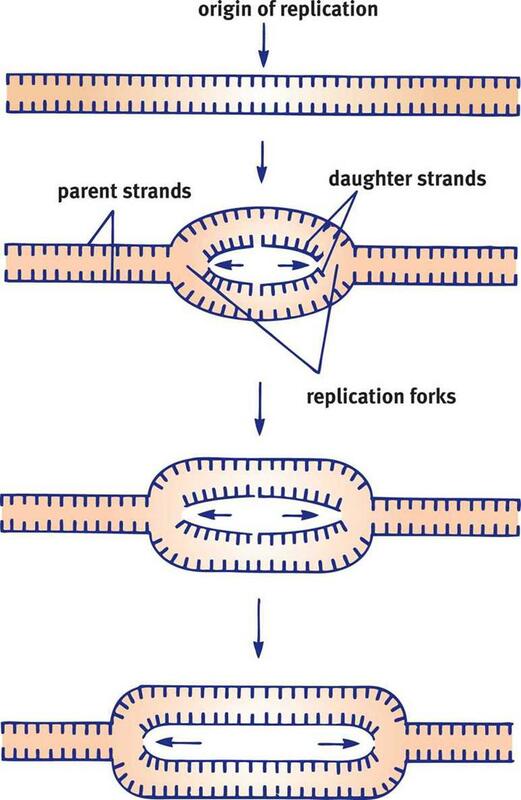 As the replication forks move toward each other and sister chromatids are created, the chromatids will remain connected at the centromere. 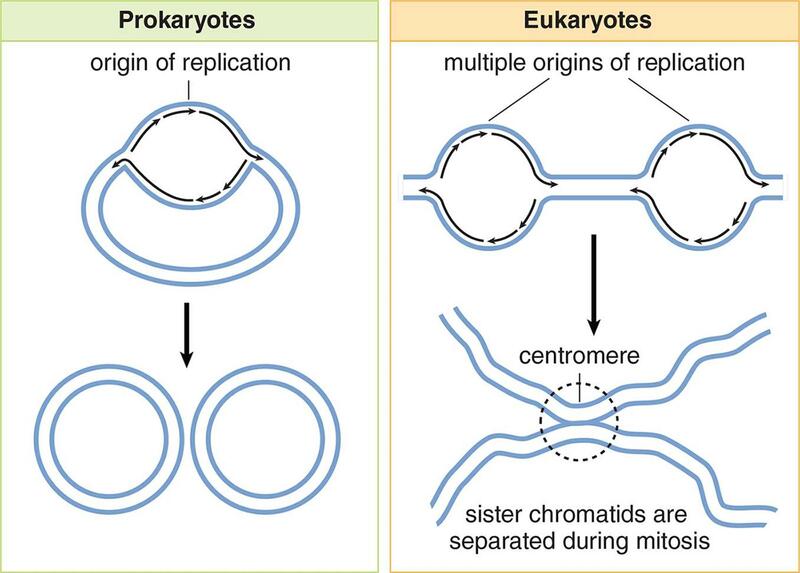 The differences between prokaryotic and eukaryotic replication patterns are shown in Figure 6.13. Helicase is the enzyme responsible for unwinding the DNA, generating two single-stranded template strands ahead of the polymerase. Once opened, the unpaired strands of DNA are very sticky, in a molecular sense. The free purines and pyrimidines seek out other molecules with which to hydrogen bond. Proteins are therefore required to hold the strands apart: single-stranded DNA-binding proteins will bind to the unraveled strand, preventing both the reassociation of the DNA strands and the degradation of DNA by nucleases. As the helicase unwinds the DNA, it will cause positive supercoiling that strains the DNA helix. Supercoiling is a wrapping of DNA on itself as its helical structure is pushed ever further toward the telomeres during replication; picture an old-fashioned telephone cord that's become tangled on itself. To alleviate this torsional stress and reduce the risk of strand breakage, DNA gyrase (DNA topoisomerase II) introduces negative supercoils. It does so by working ahead of helicase, nicking both strands, passing the DNA strands through the nick, and then resealing both strands. Any antibiotic ending with –floxacin (ciprofloxacin, moxifloxacin, and so on) is called a fluoroquinolone and targets prokaryotic topoisomerases. This stops bacterial replication and slows the infection. Fluoroquinolones are routinely used for pneumonia and certain infections of the genitourinary system. During replication, these parental strands will serve as templates for the generation of new daughter strands. 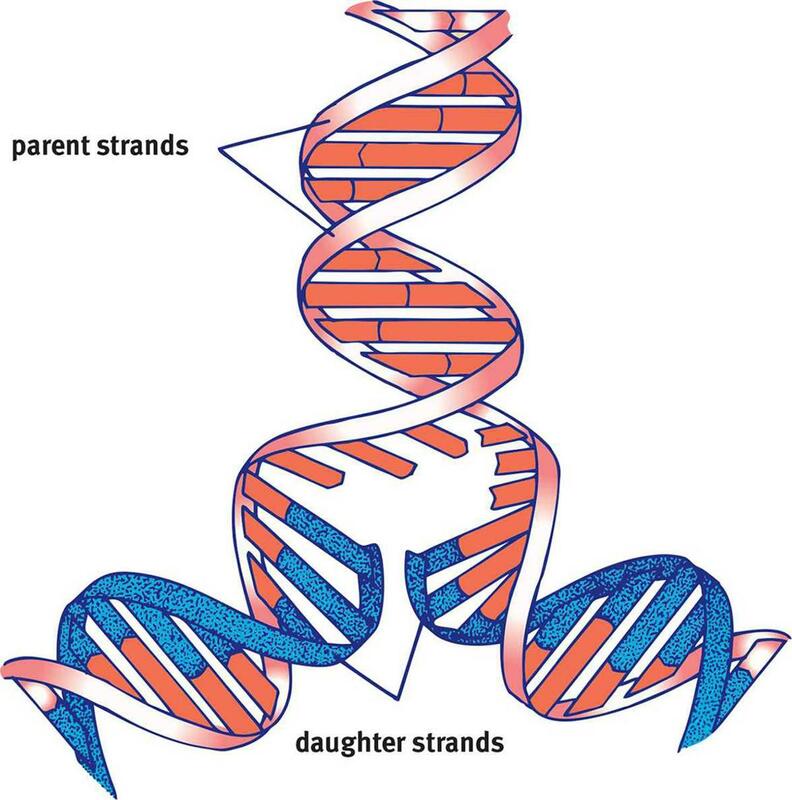 The replication process is termed semiconservative because one parental strand is retained in each of the two resulting identical double-stranded DNA molecules, as shown in Figure 6.14. Figure 6.14. Semiconservative Replication A new double helix is made of one old parent strand and one new daughter strand. DNA polymerases are responsible for reading the DNA template, or parental strand, and synthesizing the new daughter strand. The DNA polymerase can read the template strand in a 3′ to 5′ direction while synthesizing the complementary strand in the 5′ to 3′ direction. This will result in a new double helix of DNA that has the required antiparallel orientation. Due to this directionality of the DNA polymerase, certain constraints arise. Remember that the two separated parental strands of the helix are also antiparallel to each other. Thus, at each replication fork, one strand is oriented in the correct direction for DNA polymerase; the other strand is antiparallel. The leading strand in each replication fork is the strand that is copied in a continuous fashion, in the same direction as the advancing replication fork. This parental strand will be read 3′ to 5′ and its complement will be synthesized in a 5′ to 3′ manner, as discussed above. The lagging strand is the strand that is copied in a direction opposite the direction of the replication fork. On this side of the replication fork, the parental strand has 5′ to 3′ polarity. DNA polymerase cannot simply read and synthesize on this strand. How does it solve this problem? Because DNA polymerase can only synthesize in the 5′ to 3′ direction from a 3′ to 5′ template, small strands called Okazaki fragments are produced. As the replication fork continues to move forward, it clears additional space that DNA polymerase must fill in. Each time DNA polymerase completes an Okazaki fragment, it turns around to find another gap that needs to be filled in. Figure 6.15. Enzymes of DNA Replication This process involves the action of DNA helicase, gyrase, polymerase, and ligase to create two identical molecules of DNA. The process of DNA replication is shown in Figure 6.15. The first step in the replication of DNA is actually to lay down an RNA primer. DNA cannot be synthesized de novo; that is, it needs another molecule to “hook on” to. RNA, on the other hand, can be directly paired with the parent strand. Thus, primase synthesizes a short primer (roughly 10 nucleotides) in the 5′ to 3′ direction to start replication on each strand. These short RNA sequences are constantly being added to the lagging strand because each Okazaki fragment must start with a new primer. In contrast, the leading strand requires only one, in theory (in reality, there are usually a few primers on the leading strand). DNA polymerase III (prokaryotes) or DNA polymerases α and δ (eukaryotes) will then begin synthesizing the daughter strand of DNA in the 5′ to 3′ manner. The incoming nucleotides are 5′ deoxyribonucleotide triphosphates: dATP, dCTP, dGTP, and dTTP. As the new phosphodiester bond is made, a free pyrophosphate (PPi) is released. The RNA must eventually be removed to maintain sanctity of the genome. This is accomplished by the enzyme DNA polymerase I (prokaryotes) or RNase H (eukaryotes). Then, DNA polymerase I (prokaryotes) or DNA polymerase δ (eukaryotes) adds DNA nucleotides where the RNA primer had been. DNA ligase seals the ends of the DNA molecules together, creating one continuous strand of DNA. While DNA polymerase does a excellent job of synthesizing DNA, it unfortunately cannot complete synthesis of the 5′ end of the strand. Thus, each time DNA synthesis is carried out, the chromosome becomes a little shorter. To lengthen the time that cells can replicate and synthesize DNA before necessary genes are damaged, chromosomes contain telomeres. As described earlier, telomeres are located at the very tips of the chromosome and consist of repetitive sequences with a high GC-content. This repetition means that telomeres can be slightly degraded between replication cycles without loss of function. 1. For each of the enzymes listed below, list the function of the enzyme and if they are found in prokaryotes, eukaryotes, or both. 2. Between the leading strand and lagging strand, which is more prone to mutations? Why? 3. What is the function of a telomere?